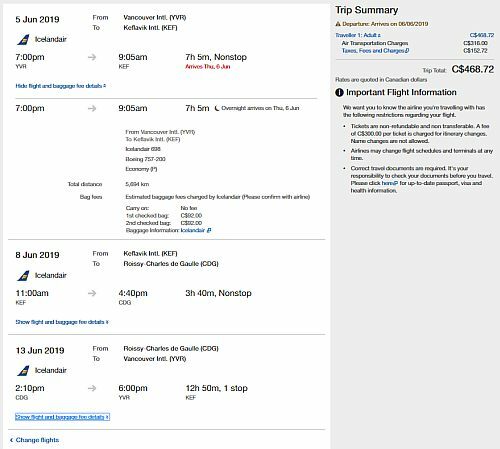 Icelandair is showing a few 2-in-1 trips that allow you to visit both Iceland and Paris, France for $468 (carry-on only) to $588 (checked bag) roundtrip including taxes. Icelandair's prices haven't been *quite* as extraordinary as they may appear at first, ever since they restructured their base fares to only include carry-on. But if their base fares drop low enough, they can still occasionally have some great prices. There are also a few flights from Vancouver to *only* Paris, France for a similar roundtrip price. vancouver, yvr, flight deals, europe, northern europe, scandinavia, icelandair, western europe, nordic countries, reykjavík, iceland, kef, paris, france, cdg and reykjavik.